A compact group of galaxies, discovered about 130 years ago, about 280 million light years from Earth. One galaxy is passing through a core of four other galaxies. 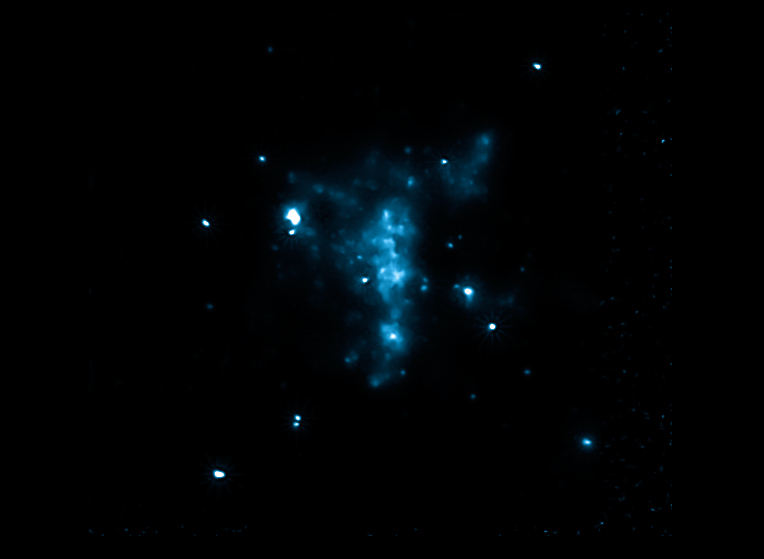 A shock wave generated from this motion heats the gas and produces X-rays detected by Chandra. 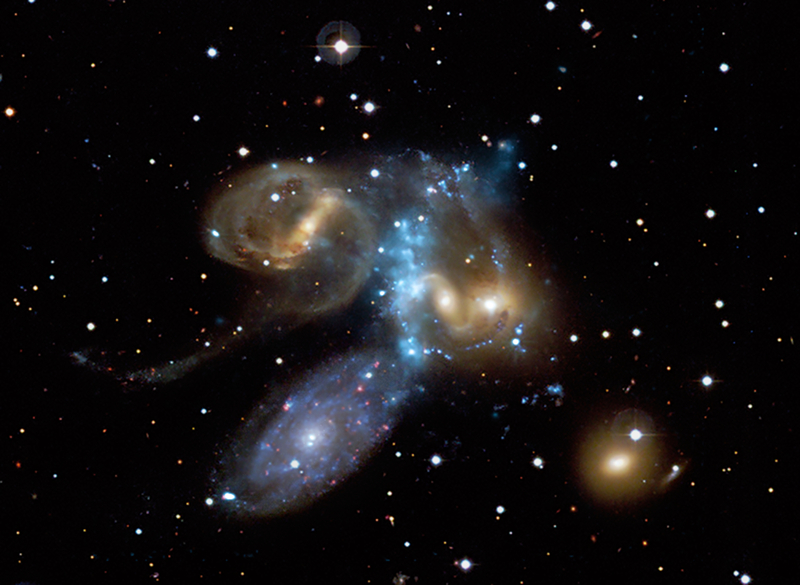 This beautiful image gives a new look at Stephan's Quintet, a compact group of galaxies discovered about 130 years ago and located about 280 million light years from Earth. The curved, light blue ridge running down the center of the image shows X-ray data from the Chandra X-ray Observatory. Four of the galaxies in the group are visible in the optical image (yellow, red, white and blue) from the Canada-France-Hawaii Telescope. A labeled version (roll over the image above) identifies these galaxies (NGC 7317, NGC 7318a, NGC 7318b and NGC 7319) as well as a prominent foreground galaxy (NGC 7320) that is not a member of the group. The galaxy NGC 7318b is passing through the core of galaxies at almost 2 million miles per hour, and is thought to be causing the ridge of X-ray emission by generating a shock wave that heats the gas. Additional heating by supernova explosions and stellar winds has also probably taken place in Stephan's Quintet. A larger halo of X-ray emission - not shown here - detected by ESA's XMM-Newton could be evidence of shock-heating by previous collisions between galaxies in this group. Some of the X-ray emission is likely also caused by binary systems containing massive stars that are losing material to neutron stars or black holes. Stephan's Quintet provides a rare opportunity to observe a galaxy group in the process of evolving from an X-ray faint system dominated by spiral galaxies to a more developed system dominated by elliptical galaxies and bright X-ray emission. Being able to witness the dramatic effect of collisions in causing this evolution is important for increasing our understanding of the origins of the hot, X-ray bright halos of gas in groups of galaxies. Stephan's Quintet shows an additional sign of complex interactions in the past, notably the long tails visible in the optical image. These features were probably caused by one or more passages through the galaxy group by NGC 7317. Coordinates (J2000) RA 22h 36m 00.00s | Dec +33° 59´ 00.00"
Thanks for your question. You are correct that the distance to NGC 7320 is about 40 million light years, and that NGC 7319 and NGC 7318 are seven times further away. This means they're about 280 million light years away (not 2.8 billion light years). Apparent size is indeed inversely proportional to distance, which means that if an object is moved 7 times closer to us it will appear to be seven times larger (not 49 times larger, which would be if apparent size was inversely proportional to the square of the distance). So, NGC 7320 is smaller, but not by an unusual amount. The distance to NGC 7320 is 40 million light years and to NGC 7319 7318 a, b, is 2.8 billion light years, which means NGC 7319 7318 a, b, are about 7 times farther than NGC 7320. As size is inversely proportional to it's distance, NGC 7319 7318 a b, are about 49 times bigger than NGC 7320. Actually they are volume, but I know it is ignorable as distances are too great. In the image, it looks their sizes are almost the same. There are bigger galaxies. However, Is it because they are really 49 times bigger than NGC 7320? Paul DiCicco yes the universe is expanding, but there are groups of galaxies that are close and massive enough to remain gravitationally attracted. This gravity between them is enough to overpower the Hubble constant, the rate at which the universe is expanding and they remain unaffected by the expansion. In our local galaxy cluster we have a few neighbors, such as Andromeda, M31. I forgot how long but eventually the milky way and M31 will crashed together just as these galaxies have. In fact all Spiral galaxies are thought to be made from collisions of smaller clusters and galaxies. Perhaps I am naive or confused on the question of Galactic collision, but if the universe is expanding in all directions, how can Galactic collision occur? Conversely, if Galactic collision is going on, is the concept of Galactic expansion in error? I understand that NGC7320 one of the five galaxies in this Stephan's Quintet group has a very different red shift to the others. Do the Chandra images clarify whether 7320 is close to the others, c280 million light years away or is a relatively tiny, foreground object, just 40 million away, and in the line of sight by pure chance? Do you know the approx distance across the picture of Stephan quintet? I'd like to understand the magnitude of the size of each galaxy. Is there a way to calculate the distances? This is one breath taking image. Thanks for providing such info to us. I'm making this my wallpaper. Wow. Thanks for the pictures. stars. The red objects are likely a mixture of background galaxies and foreground stars in our galaxy. Yes, we are seeing 280 million years into the past in this image, so by now things will have changed. However, most of the stars in these galaxies will still exist and depending on their three-dimensional positions and speeds, the spiral galaxies might all still largely be intact, rather than evolving into elliptical galaxies. Way) and Andromeda (M31) in several billion years. It makes me wonder, how many living beings have died in those galaxies? Since 280 million years have passed the collision has been proceeding for a long time. I wonder what is actually going on right now in those galaxies? Very interesting. Does this collision in any way affect our galaxy or could we be looking at a collision of another galaxy with ours in the distant future? Brings up a lot of questions. I am still amazed at our ability to observe these occurrences, keep bringing this info to us. I congratulate NASA guys for proving human imagination. Is what we are seeing happened 280 million years ago? So they may not even exist anymore. I presume the blue and pink circles represent stars. If so, what type? Are there types of stars here. Great photograph. I am so overwhelmed with the beauty this and all the pictures you have supplied us with and too a wee bit jealous, one day we all could go with you, maybe. So proud of you ALL the wonder be safe and shake the hand of GOD to say thank you. Take care gentlemen. My name is Alejandra Isabel Nava Nava and I'm from Mexico. I only say that this information is so fantastic. I can't speak English very good, my mother tells me that I won't visit the USA and I can't study in your country United States, but I believe in me. I love all the mysteries of the universe. Thank you. Thank you for making it a composite with a visual image. Like most ordinary space buffs I recognize well-known cosmic objects in visible light but being shown an X-ray ridge and being told that this is Stephan's Quintet doesn't do that much for me. So thank you for showing me the interplay between visible light and X-rays. And thank you for showing me a labeled image of the galaxy too. I am a complete ignorant on this matter, but I am trying to learn from your excellent articles. Congratulations. This is another opportunity to follow learning about the complex process of galaxies collision and understand the evolution of this systems in the time.